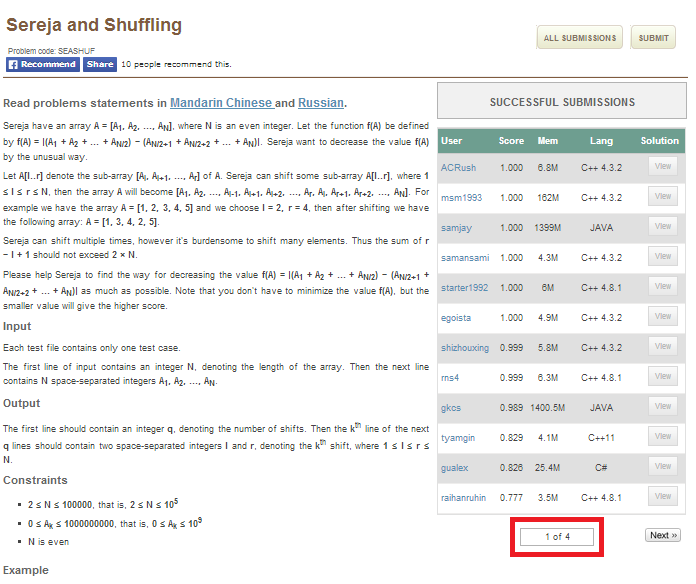 The number of successful submissions for sereja and shuffling has suddenly become more than 400 on the contest page but only 45 correct submissions are shown on the problem page. Here are the screenshots. @admin Please have a look at this and resolve the issue. I think successful submission means AC’ed solutions among all submitted solution so It doesn’t mean that this problem is solved by the number of persons equal to the successful solutions. This is wrong way , there must be one another column to present the number of programmer solved this problem. 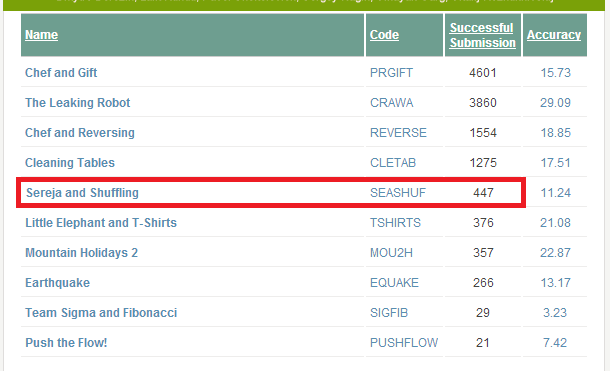 SEASHUF is solved by only 47 people till now, but its showing > 590 successful solutions. When today morning I saw the contest page I thought OMG What happened with SEASHUF problem that these many people submitted it correctly. Codechef must look into this. Your expectations meets mine, but I never take as good look as you did. Who is interested that some=one submitted ACed solution 10-time? For people in doubt, the number of successful submissions on contest page is the number of users who have submitted at least one correct submission. the bug has been fixed now.